Double-DVD Set! 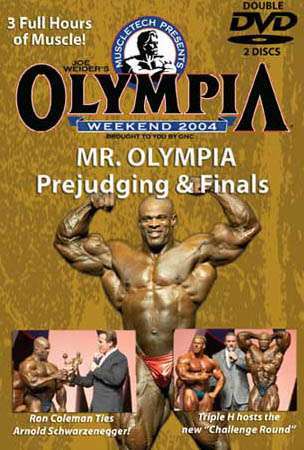 Mr. Olympia Prejudging and Finals on two DVD discs – 3 hours of muscle and all the excitement of the Olympia. KING RONNIE crowned by the Governator! Governor Arnold Schwarzenegger presented the Sandow Trophy to Ronnie Coleman for tying his record. PREJUDGING: See it all, just as the live audience did at Mandalay Bay . The eight compulsory poses by all 19 Mr. Olympia competitors, the symmetry round, and the exciting muscularity round compulsory poses to determine the placings going into the evening finals. A must-see for every true bodybuilding fan, you can actually judge at home with the clarity and richness of these incredible images, digitally recorded for high-definition broadcast standards and then edited into DVD for standard televisions. KING RONNIE crowned by the Governator! Governor Arnold Schwarzenegger walked onto the Olympia stage holding the Sandow trophy and presented it to Ronnie Coleman for tying his record. Both men stand only one victory away from all-time leader Lee Haney. See the fantastic new “Challenge Round” introduced by Sylvester Stallone and hosted by WWE star Triple H where each of the top six Olympia finalists called each other out for mano-a-mano poses to determine the final placings. The new ‘Challenge Round’ was introduced, changing the way the final top six were scored in the last round. The top six competitors scores were discarded after round three, and only the final round mattered in who would win. In the new format, Dexter was the loser, and Gustavo was the winner. The difference was worth $10,000. Ronnie still was the clear winner.